Hawaii !!! Yes, we'll be returning to Kauai this winter for housesitting. We couldn't be more jazzed. Why? Well, because it's Hawaii and it's beyond beautiful as a place to explore and enjoy. But what's better than that? 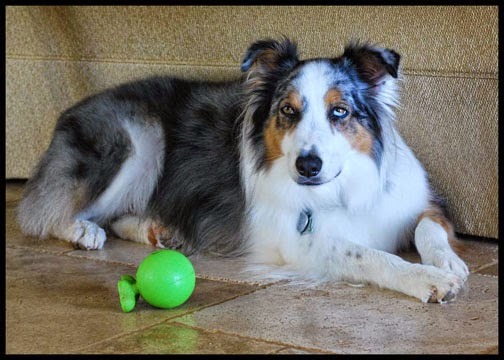 An Aussie Shepherd named Kai who stole our hearts last year when we took care of "his" house. It was a very sad day when that house sit ended and we thought we'd be saying goodbye to beloved four legged friend. When Kai's mom and dad asked us to return this year we were ecstatic that we'd be able to spend more time with Kai exploring the lovely island of Kauai. Our adventure begins in late October and we'll be there until early 2015 so come back and join us for some island time later this year. 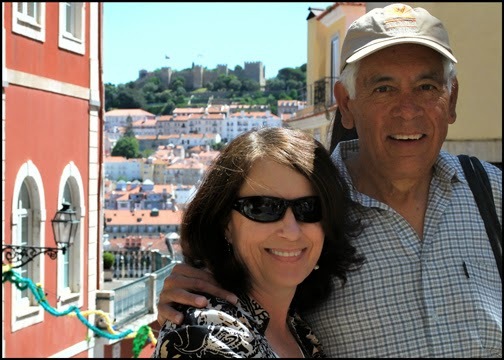 In the mean time...we're always happy to help spread the word about how fantastic house sitting is and so we were excited to be interviewed recently for an article in PBS Next Avenue. 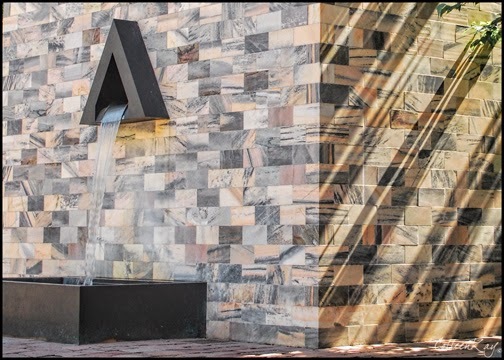 Interested in more information? You can find the article here. 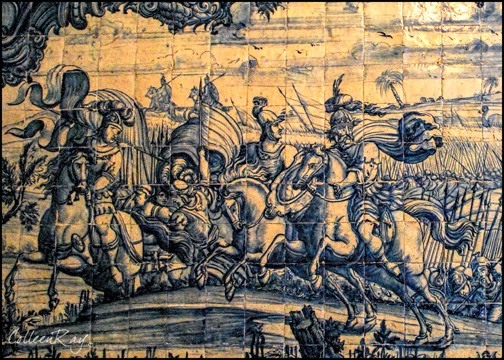 Lisbon was once a grand city and one of the wealthiest in Europe during the 15th and 16th centuries when Portugal's explorers sailed the world opening new trade routes to India and Africa. Then in 1755 a massive 9 in magnitude earthquake just offshore leveled two thirds of the city. 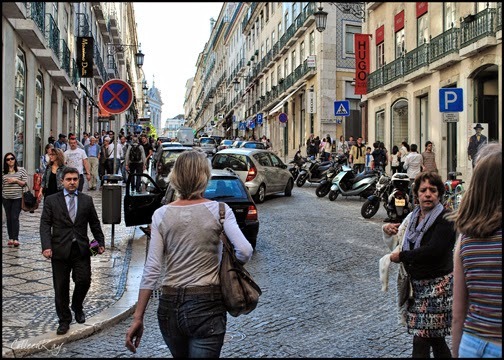 The quake and the subsequent tsunami and fires destroyed the city killing an estimated 90,000 people - about a third of Lisbon's population. 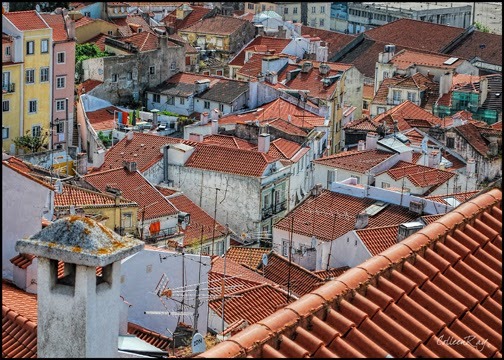 A more modern Lisbon was rebuilt and was the first city to have any type of quake proof construction. 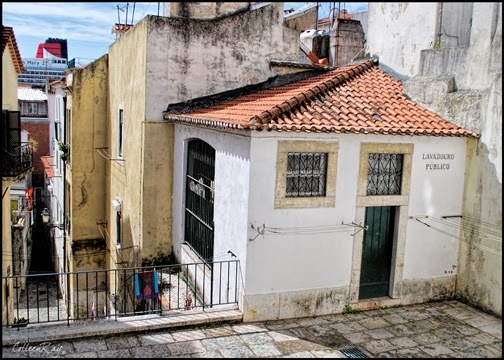 The area that survived the quake intact is called the Alfama and dates back to around the 6th century. 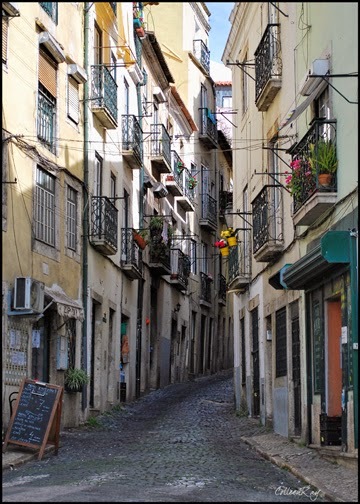 It's easy to get lost on the narrow cobbled streets that twist and turn up the hill to Sao Jorge Castle. 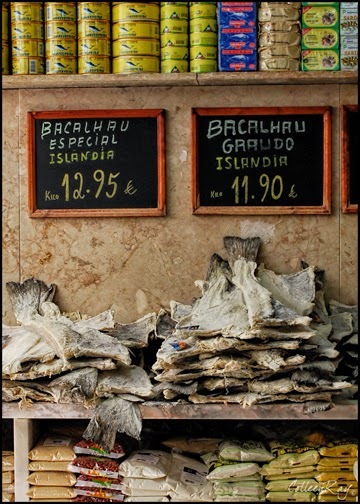 The Alfama couldn't be more different from the historic downtown area known as the Baixa. 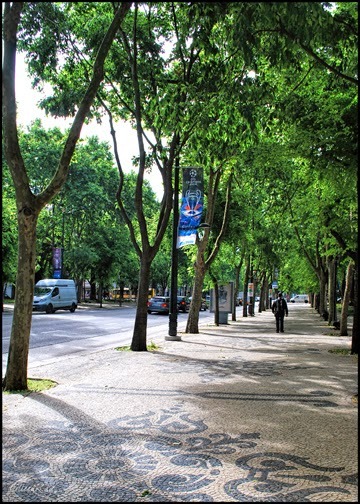 This area of Lisbon was rebuilt after the quake on a grid plan of straight streets, wide boulevards, and large public squares. 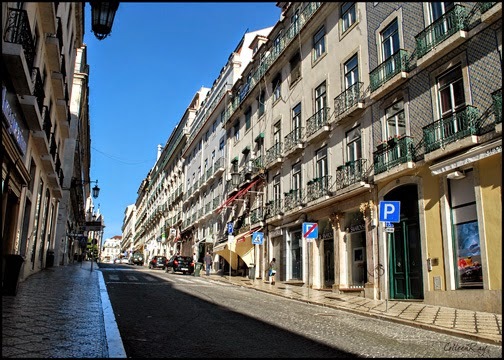 The Bairro Alto (upper town) and the trendy neighborhood of Chiado sit on the hill above the Baixa. 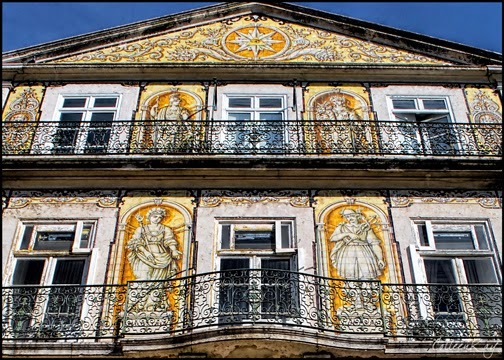 Then there is Belem, a suburb of Lisbon that is about three miles from downtown. 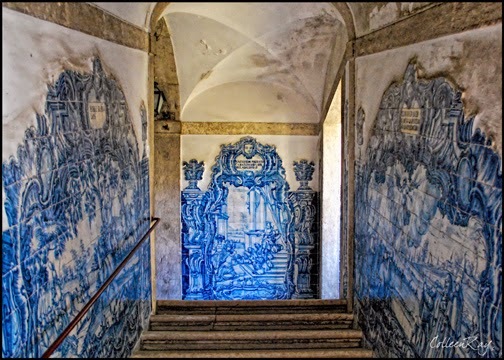 Belem is where the King of Portugal and the aristocracy rebuilt after the quake and where the current president of Portugal has his residence. 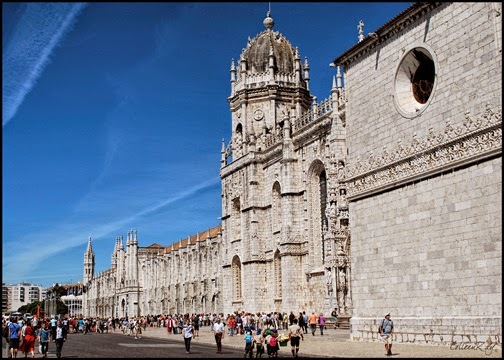 It is also the site from which early explorers set sail and Portugal's most famous explorer Vasco da Gama is laid to rest at the Monastery of San Jeronimos. 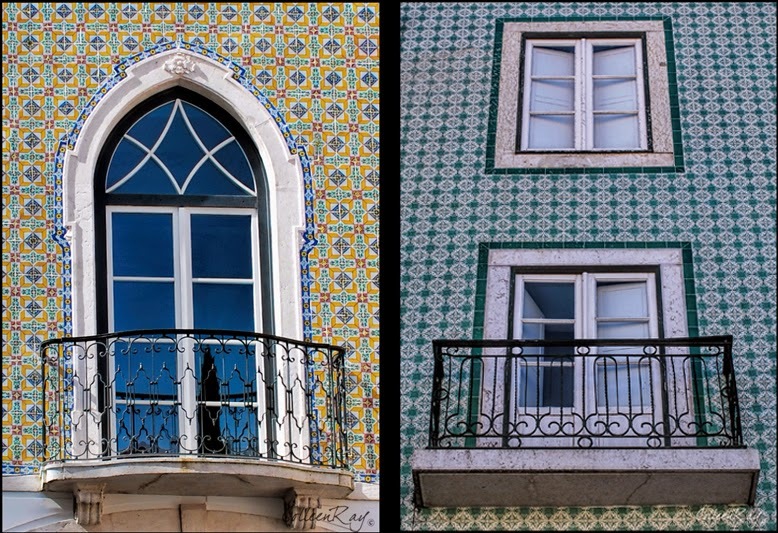 Each of these distinct areas make it seem as if Lisbon is many cities all rolled into one. 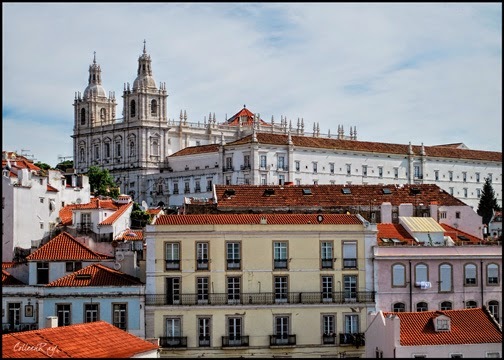 Rick Steves' described the city as a "ramshackle but charming mix of now and then" and that's really how Lisbon felt to us. immigrants from Brazil and the Ukraine. Narrow streets are barely passable by cars. 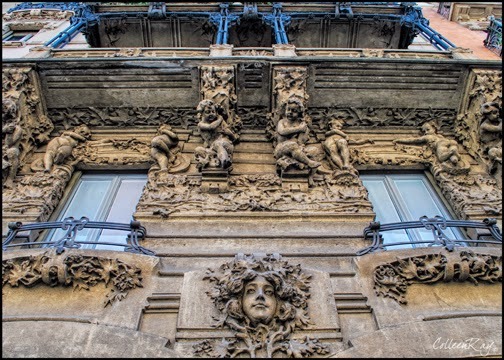 The oldest part of the city shows its age. 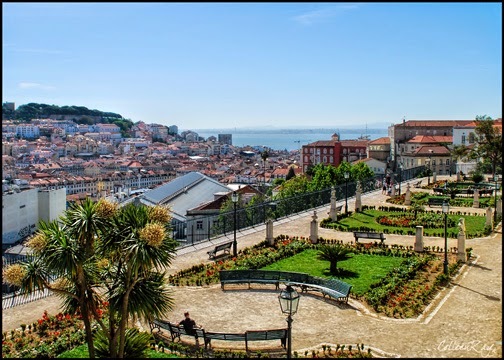 Sao Miguel sits above the Alfama neighborhood. 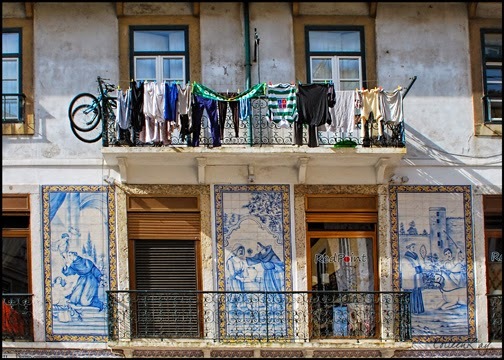 Few homes in the Alfama have their own so there are public laundries and bathrooms. Antique 1920 trolley's navigate the wider streets in the Alfama. 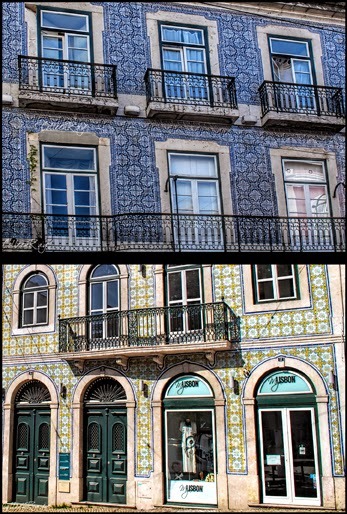 evident in Lisbon's architecture and widespread use of tile. 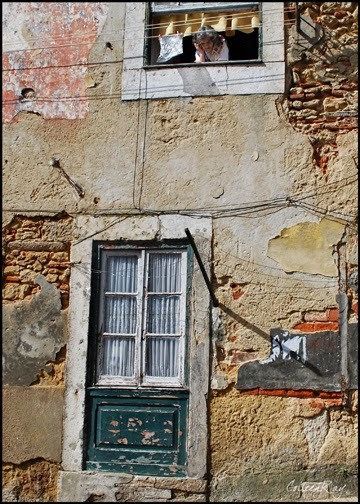 A little bit of springtime in the Alfama. 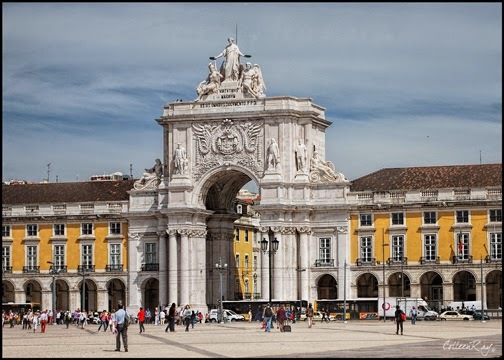 Palace Square and Lisbon's Arch of Triumph. 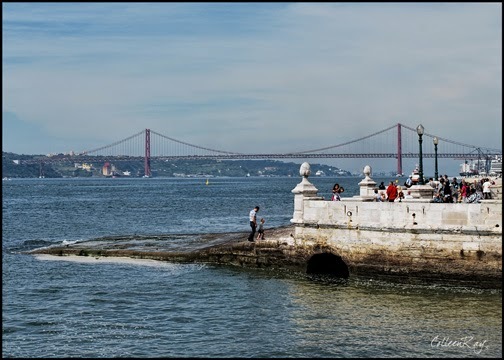 San Francisco constructed this bridge over the Rio Tejo. 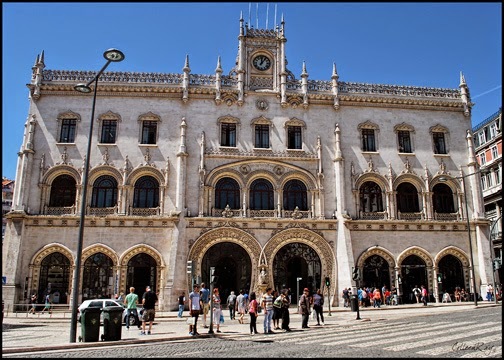 The circa 1900 facade of the Rossio Train Station. 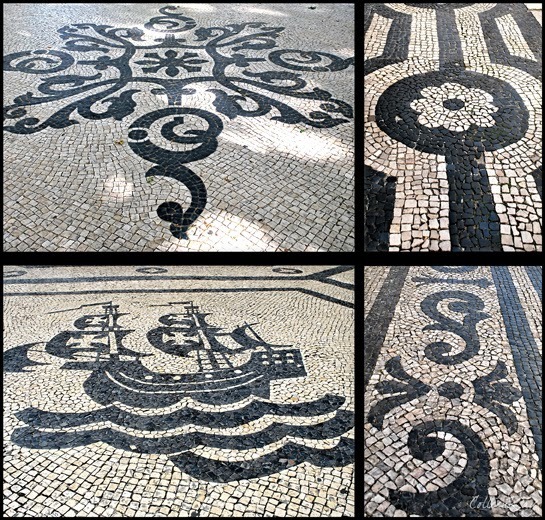 The cobbled streets are works of art. 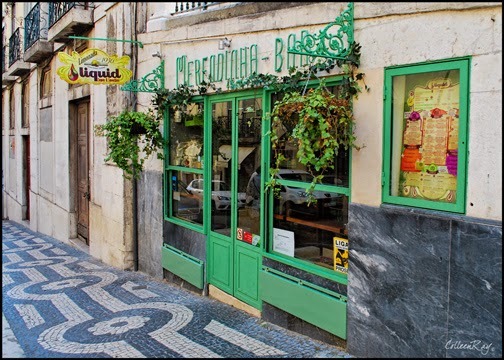 There are lots of little shops and restaurants in the Baixa. for three days prior to preparation. 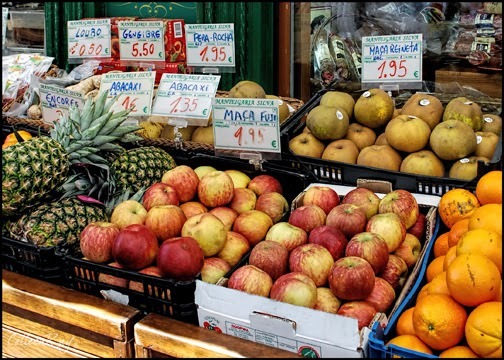 We recognize the fruit but just could not pronounce the names. 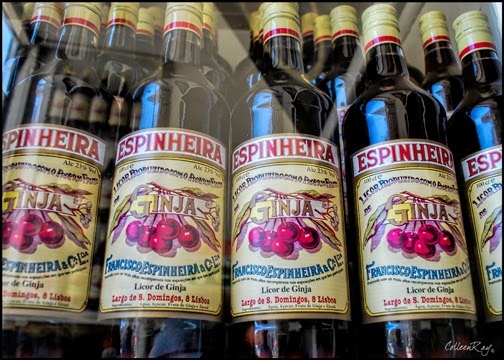 Jinja is a potent cherry flavored liquor sold in local shops. A Euro buys you a shot glass full which is all you need. 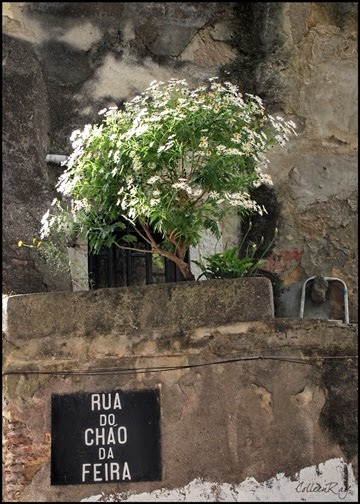 Rue Garrett in Chiado was a central location for our apartment. ....but with a completely different vibe as the day turned into evening. 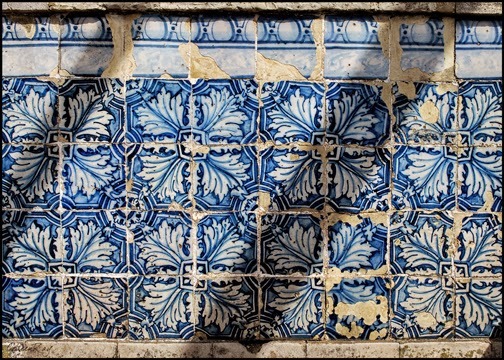 Some of the older hand painted tiles are quite detailed. Some have more traditional Moorish designs. Some tile work has a message. View of the Rio Tejo from the Miradouro de Sao Pedro de Alcantara. View of the Sao Jorge Castelo. 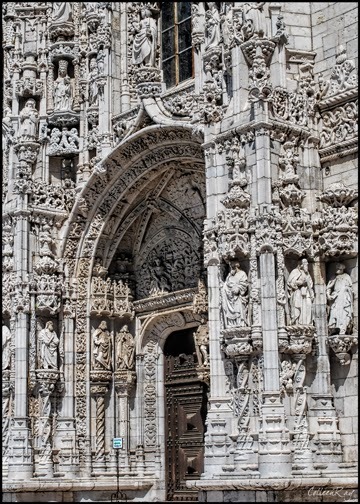 Facade detail of Monaster of Sao Jeronimos. 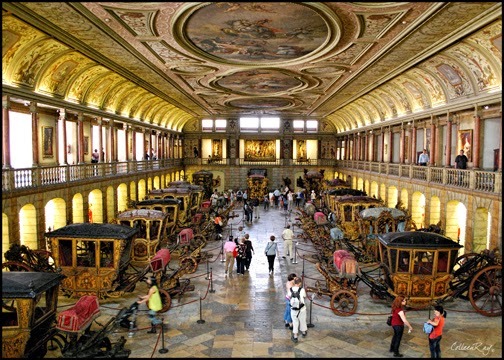 Belem is home to several of Lisbon's museums including the National Coach Museum. A remarkable collection of royal coaches dating from the early 1600's. The Maritime Museum houses the antique royal barges used for sailing on the Rio Tejo. 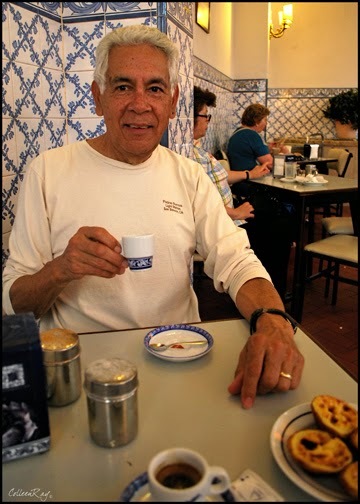 Casa Pasteis de Belem is the birthplace of the sublime custard tart pastel de nata. crispy, flakey pastry shell has been a closely guarded secret. with a bica a.k.a. espresso. 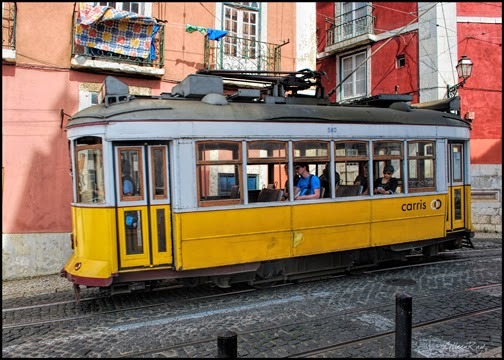 We hope that you've enjoyed Lisbon! 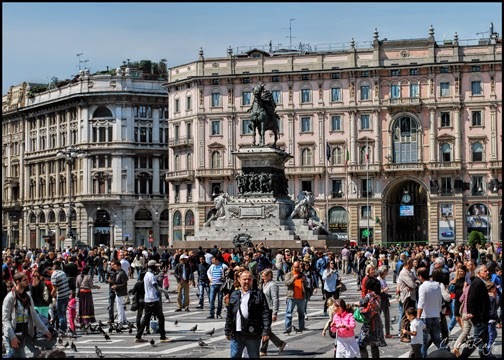 It may not sound like much, but 24 hours in Milan was a generous amount of time compared to last year. 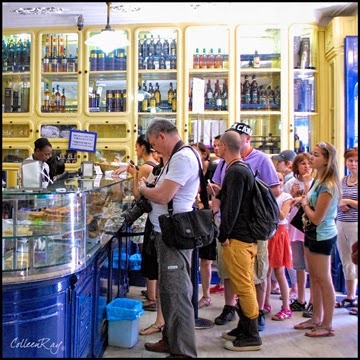 Last year we had less than 60 seconds in Milan - a late train from La Spezia put us into the station mere seconds before our connecting train to Venice departed. So 24 hours was a lot, especially since we didn't plan on being there in the first place. But we had an extra day sooooo.....24 hours in Milan. It was crazy busy and it was a holiday so most of the major sites were closed. 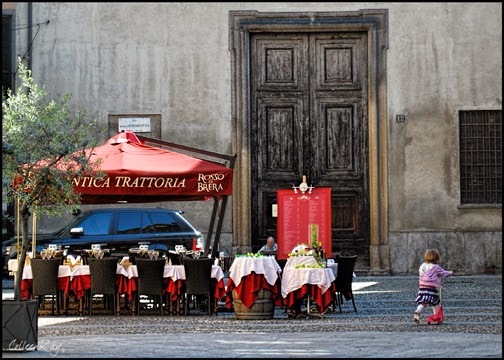 No visit to the La Scala Opera house, no visit to the Last Supper. But we had a great time just wondering around the city. and put them together over 500 years? 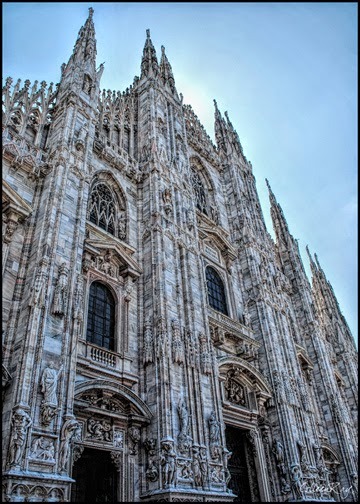 The Duomo - the 5th largest cathedral in the world. lucky enough to be in the right place at the right time. 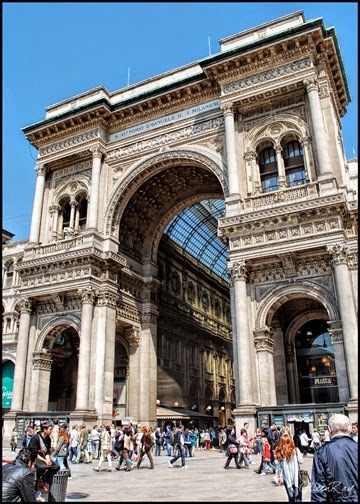 Milan breathes fashion and shopping is the thing to do. 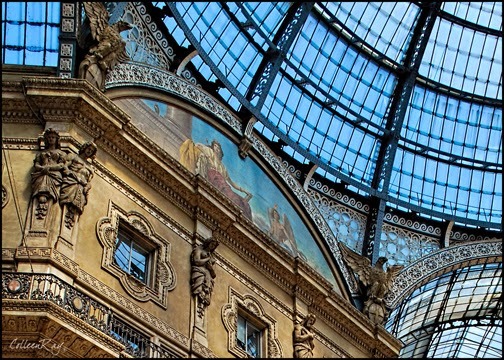 The Galleria Vittorio Emanuele II lends an old world elegance to current fashion design. 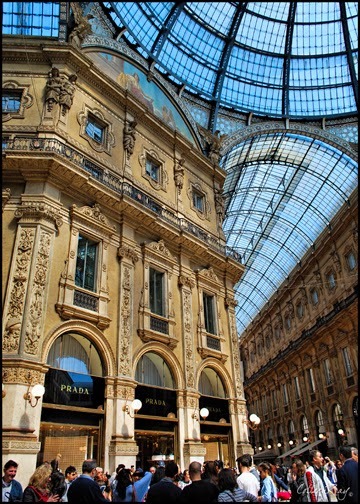 Home to the flagship Prada store, Louis Vuitton and Gucci. The lovely Galleria was constructed in 1867. 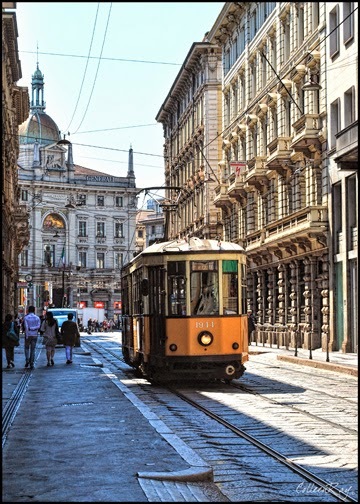 A more modern Milan - but notice that the stone is the same as that of the Duomo. 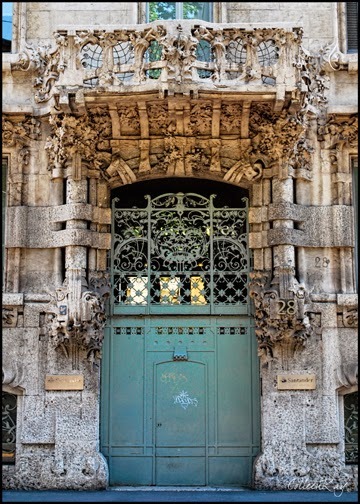 There is Art Nouveau/Art Deco Milan. 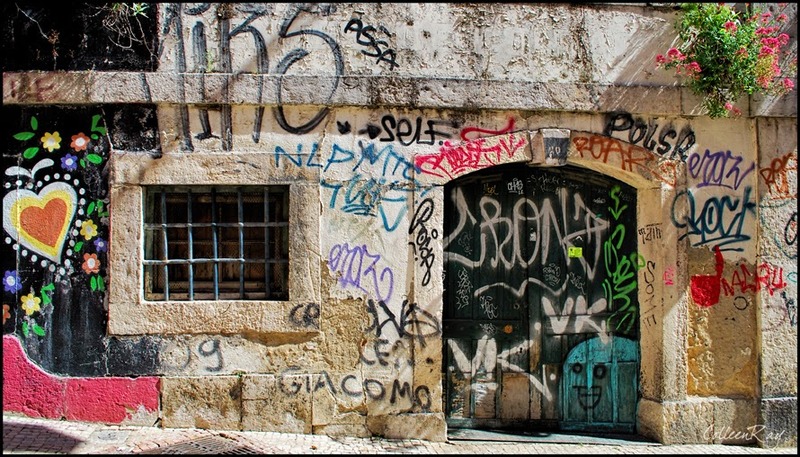 The Milan of the grand (and grafittied) entrance. Decorative to the max Milan. 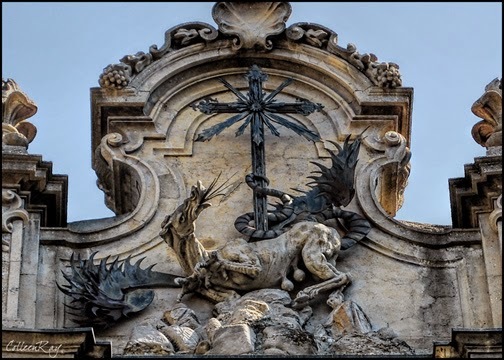 The Milan of odd creatures - a church facade. 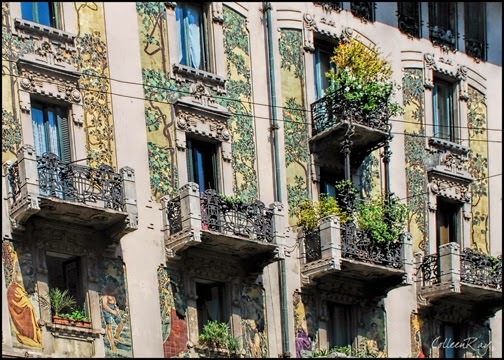 The Milan of quieter side streets that 1.3 million people call home.